If you’ve been reading eNotes study tips for a while now you’ll already know the importance of making flash cards and creating a study schedule in time for finals week, so here’s a new tip for you. Make a pact with a friend to be accountabilibuddies; you will agree to check in with and keep each other on the studying track leading up to your exams. If one of you strays, the other is “accountabilibuddyable,” and reserves the right to publicly shame you, or at least make you donate $1 to the procrastination jar. If you know everything there is to know about mineral compounds but missed a whole class on the rock cycle, you should know which topic to spend more time revising. It’s obvious, right? And yet, lots of students waste time revisiting the facts they know best, perhaps for some kind of reassurance that everything will be okay come test day. Everything definitely will be okay, as long as you spend more time covering the areas you feel shaky on first. Just because you’re studying doesn’t mean you have to be cooped up in a dark room. In fact, you actively should not do that. Luckily for you there’s a great place nearby for you to meet up with a group or just change your surroundings. It’s a big open space with lots of shelves, probably a few computers and meeting rooms. Check with your school as every one has one. It’s called… a “library.” I know, weird. 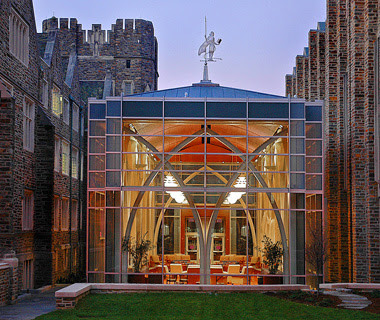 Who wouldn’t want to study in this Duke University library? Good luck on your finals, and have a great winter break! Any questions or comments? Respond below! We welcome your feedback.